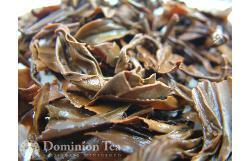 Our focus at Dominion Tea is on finding great tea from around the world that we can share with our customers. Since our definition of great tea is actually a combination of great quality loose leaf tea, its ties to history and culture, and having a great story, we are thrilled to be offering a number of great Nepali tea products from the rugged landscape of eastern Nepal where farmers work together to share in production and success from specialty loose leaf tea. As we’ve mentioned before in our post on the history of Nepal tea the country has a significant lack of infrastructure and getting products out of the country can be quite difficult. The Ilam District of Nepal, which has emerged as the major tea producing region of the country, is located 350 miles from Kathmandu. However, travel to Ilam averages 18 hours. Compare this to a trip of similar distance from Washington, DC to Hartford, CT which would take closer to six hours and one can imagine just how difficult travel can be in the country. Despite the difficulties, or perhaps because of the relative closeness to Darjeeling India, which is about 45 miles away, the Nepali government has focused on developing the tea industry in this region. 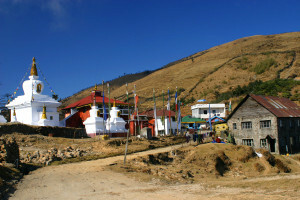 The Ilam region is dominated by Buddhism and Hinduism and lies in the shadow of Sandakphu peak. The area is very rugged and a favorite of hikers and trekkers from around the world. In the Nepalese language, Sandakphu is a place for monks to meditate. It is the highest habitable point near the district of Ilam. The Ilam district is located on the far eastern edge of Nepal, adjoining Sikkim and the Darjeeling hills of India. This area is famous for the Maipokhari Ramsar Site, which is a world heritage site for mountain wetlands and the Maipokhari Holy Shrine. In addition, this tranquil environment has a biodiversity that is highly unique, and is home to many endangered species of wild flora and fauna. The character and flavor profile of Sandakphu produced teas is unique to its bio-diversity, relatively new plants, and its high altitude location. The production of Nepali tea products which we selected come from tea gardens located between 6,500 feet and 8,000 feet and above. The location is in the foothills of Sandakphu peak and while it is relatively close to Darjeeling, the tea crafted here provides flavors and character which can be compared to none in the world. It is a unique cooperative tea enterprise and is unlike many others in the industry. In additional to the woman who owns the production facility, local farmers actually own the property, tea plants and are share-owners in the factory. This helps ensure that farmers have a significant stake in the success and, as shareholders, directly benefit from the high quality product. Tea quality starts from the green leaf that is provided to the factory for processing, and since ownership of the garden is at farmers’ level, the farmers commit to grow and harvest only the finest leaf for processing resulting in outstanding product. Close up of steeped Ruby Oolong tea leaf. Golden Buddha Oolong Tea – Golden color, mild mellow flavor with a sweet finish. Himalayan White Tea – First flush, sweet, crisp, and floral aroma. Kathmandu Gold Black Tea – Deep golden liquor with honey and stone fruit flavors. Monkey Temple Green Tea – Beautifully rolled, sweet vegetal aroma and highly flavorful. 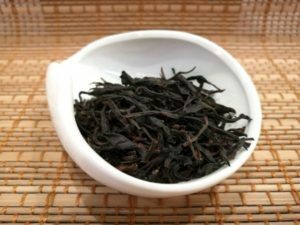 Ruby Oolong Tea – Amber liquor with a nose of apricot and muscat grape. Just a hint of butterscotch on the tongue.